February 28th 1928; "I'm worried about all the people in New Orleans. Tell them I love them, and I wish I was home with them. I hope we'll see them soon." That was the message that Fats Domino most wanted broadcast to the rest of the world when he the press first caught up with him in the aftermath of Hurricane Katrina in 2005. Reported missing and feared dead, the blues, R&B and rock-and-roll legend had in fact been rescued from the rising waters around his home in Lower Ninth Ward the night after the levees broke. His reluctance to evacuate and his eagerness to return to New Orleans were typical of the man so closely identified with the city of his birth. 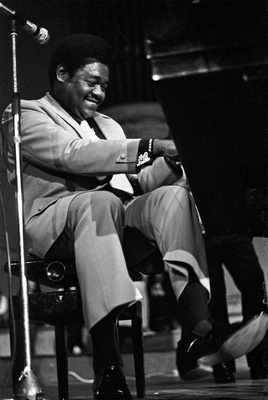 Antoine Dominique Domino was born in New Orleans on this day in 1928. Antoine Domino was the youngest of eight children born into a Creole family that spoke French as its first language. Domino's father was a fiddle player, but it was his much older brother-in-law, Harrison Verrett, who taught young Antoine the piano. By age 10, Antoine was playing professionally in New Orleans honky-tonks, where he earned the nickname "Fats" from bandleader Bill Diamond. In 1949, he caught the eye and ears of trumpeter, band leader and Imperial Records talent scout Dave Bartholomew, and a legendary partnership was born. The first record Fats Domino put out with Bartholomew as his producer/collaborator was 1949's "The Fat Man," a big, foot-stomping boogie-woogie that established Domino's signature sound. Over the next half-decade, Domino's backbeat-heavy, rolling piano played a vital role in defining the shape of rock and roll. "Ain't That A Shame" needed a boost from Pat Boone's white-bread cover version before finding its way to the pop charts in 1955, but that breakthrough paved the way for two more top-five pop hits in "Blueberry Hill" and "I'm Walkin'" in 1956 and 1957, respectively. After three decades as a major international star—a star who sold an estimated 65 million records worldwide—Domino went into semi-retirement in the 1980s, announcing that he would no longer travel outside his native New Orleans. A man of his word, Domino was not enticed to travel even to be honoured with a Lifetime Achievement Grammy, a National Medal of the Arts from President Bill Clinton or induction into the Rock and Roll Hall of Fame. Domino remained a neighbourhood fixture in the Ninth Ward, however, living in his colourful double-shotgun mansion and making occasional forays out to local clubs in his enormous, bright-pink Cadillac. Not surprisingly, Fats Domino returned to New Orleans as soon as he could follow Hurricane Katrina. Domino died on October 24, 2017, at his home in Harvey, Louisiana, at the age of 89, from natural causes, according to the coroner's office.